Everything about this animated ode to the Batman ‘66 TV series is the most fun thing I’ve seen in ages. There are quick costume changes, holy things, sound effects, puns, and A GIANT OVEN labelled “GIANT OVEN.” Really, what more could you want from this movie? It’s been a rough few weeks for pure fun, but this trailer provides it in spades. It’s hard to beat “You fiends, you will rue this day” and “The only roux here is in the gravy!” It’s just... so pure, so beautiful. Excuse me while I wipe a tear of joy from my eye. Even the end of this trailer, where we get a message about the importance of not jaywalking, is sublime. I want to live in it. 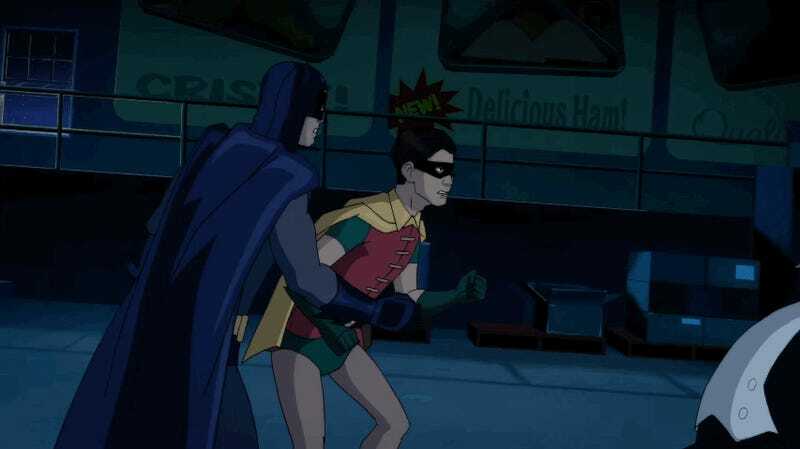 With Adam West, Burt Ward, and Julie Newmar reprising their old roles by doing the voices of Batman, Robin, and Catwoman, Batman: Return of the Caped Crusaders will be available digitally on October 11th, and on Blu-Ray November 1st.